Lisa Nigro, the former police officer who started Inspiration Corporation and has helped improve the lives of so many vulnerable people in Uptown, even winning the Presidential Citizens Medal for her philanthropy and dedication to this community, is having some challenges of her own right now. Her 18-year-old son has had a series of heart attacks and that has put a terrible financial burden on the family. 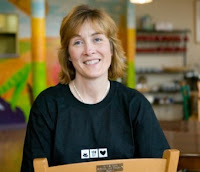 "Many of you know or know of Lisa Nigro, founder of Inspiration Corp. and Café. This amazing woman is, hands down, the fiercest force for good in Uptown. She and her family are now facing a challenge that would humble Hercules. As strong as I know she is, she and her family could use your help. Donate what you can, pray, and read: http://nick2127.tumblr.com. Yeah, she’s an amazing writer, too. The YOU CARING Fundraising Page is at https://www.youcaring.com/the-nigro-family-463208." If you can help this woman who has helped so many, please do so. UU articles about Lisa are here.